The soldier who led the Allied troops with his bagpipes on D-Day has received a preview of a statue to his heroism. Bill Millin, 86, was guest of honour at a reception near his nursing home in Dawlish, Devon, on Thursday as a French party gave him a model of the tribute. The Glaswegian plans to be in Normandy on the 66th anniversary of D-Day in 2010 to unveil the life-size image. The wooden model of the statue was presented in a box to Mr Millin, who wore a kilt to mark the occasion. "It is a good likeness, I was 21 then, very young," he said. "It is very good of the French to do this for me." Mr Millin, who has lived in Devon for the past 44 years, is recovering from a stroke and uses an electric wheelchair. 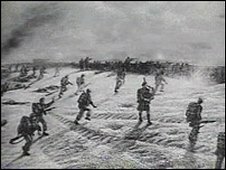 When the Operation Overlord offensive was launched on 6 June 1944, Scottish servicemen were among the first to land on Sword Beach at Normandy. Lord Lovat led his commandos ashore to the skirl of the bagpipes and asked piper Millin, then aged 21, to play to rally the troops' morale, defying official orders that pipers were vulnerable and should not play. Later the Germans claimed they did not shoot him because they thought he must be "mad". Lord Lovat's men went on to fight their way to Pegasus Bridge where they met the 6th Airborne Division. 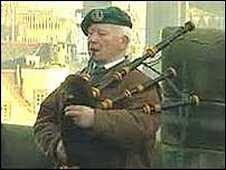 In 2001, his famous pipes - which were silenced four days later by a piece of shrapnel - were handed by him to the National War Museum of Scotland. The picture of the 21-year-old commando playing his pipes became one of the enduring images of the landings, which paved the way for Hitler's defeat. His exploits were depicted in the film, The Longest Day. The statue has been donated by the people of Colleville-Montgomery, which he helped to liberate in 1944. The French party at the civic reception was headed by Serge Athenour de Gourdon, the chairman of the Mary Queen of Scots Pipe Band of France.